Edmentum (edmentum.com), a global education leader and a pioneer in online teaching and learning solutions, has secured three finalist placements for The EdTech Awards 2018—Edmentum’s programs Edmentum Courseware, Exact Path, and Study Island have all made the list. The EdTech Awards recognize people in and around education for outstanding contributions in transforming education through technology to enrich the lives of learners everywhere. 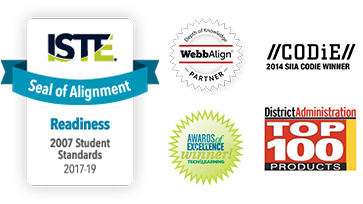 All three programs made the Cool Tool Awards as finalists in various subgroups—Edmentum Courseware for e-learning, blended, or flipped solution; Exact Path for new product or service; and Study Island for testing prep solution. This year’s finalists and winners were narrowed from the larger field and judged based on various criteria, including pedagogical workability, efficacy and results, support, clarity, value, and potential.